As the renewable energy industry continues to grow, more and more is showing up in places other than the mainland. Offshore renewable power is a relatively new frontier for clean energy that has quite a bit of potential. While offshore wind has come the farthest and gets the most attention, there are other offshore generation resources that may start making waves in the near future too. The first offshore wind farm appeared as a demonstration project in Denmark in 1991, and Europe more recently began expanding its offshore wind capacity substantially. The first in the United States, located off the coast of Rhode Island, became operational in December 2016. States including New Jersey, New York and Connecticut have recently announced commitments to offshore wind investments. As the U.S. and other countries look to expand their offshore wind capacity, they’ll have to come up with some innovative technological solutions. 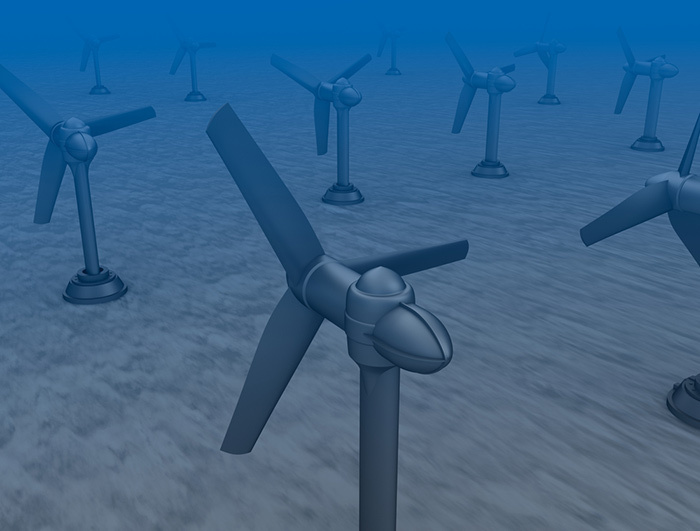 One of the biggest advancements is placing wind farms in deeper water, which requires the use of floating platforms like those used in the oil and natural gas industry. This similarity has contributed to oil and gas companies making significant investments in offshore wind. Other innovations that may help farms to better capture energy from the powerful winds that occur offshore include two-bladed rotors, downwind rotors and high-temperature superconductors. Although most solar farms are built on land, some countries have begun experimenting with building them offshore too. Since oceans cover over 70 percent of the earth’s surface, they represent a lot of potential energy. China now has the largest offshore solar farm in the world, which has a 40-megawatt capacity. Interestingly. Sungrow Power Supply built it over a former coal town that has since been flooded. Researchers have recently developed a flotation system called Heliofloat made from a soft, flexible material that helps to move with the natural movement of the ocean while still operating. While building power plants at sea comes with plenty of challenges, it also has some advantages. It doesn't take up land that has other uses, which is especially important in densely populated countries. The ocean also naturally cools the panels, which helps them to operate more efficiently. These benefits and the continued technological advances will make offshore solar an option for more people in the near future. Even as energy production continues to grow, researchers are looking for new and innovative ways to generate more. Global energy production reached 13.8 million tons of oil equivalent in 2014 after increasing by 1.5 percent from the year prior. As global populations grow, energy consumption has increased substantially in recent years as well. One energy resource that has the potential to increase production even further and help meet growing demand in the near future is ocean wave energy. It’s rarely captured due to technical challenges, but research into this area could make it a more feasible source of power in the coming years. Experts often say that wave power is about where wind power was three decades ago. The concept is agreed upon, but engineers haven’t developed a widely accepted design for the necessary equipment. The Electric Power Research Institute (EPRI) estimates that the wave energy resource potential along the U.S. outer continental shelf is 2,640 terrawatt-hours per year (TWh/yr) and that 1,170 TWh/yr of that is recoverable. The latter amount is more than a quarter of what the entire U.S. uses each year. A range of wave energy technologies for near-shore, offshore and far offshore use is being designed and tested, and a few are even undergoing demonstration. Terminator devices, attenuators, point absorbers and overtopping devices are among the most promising, but only time will tell which ones come out on top. Capturing energy created by ocean currents is another possibility that researchers are looking into. Because ocean currents are relatively constant, the energy they generate would be reliable. And since water is dense, they carry a lot of potential energy. Water is 800 times as dense as air is, so water traveling at 12 miles per hour creates the same amount of force as wind traveling constantly at 110 miles per hour. Ocean current energy technology is at a very early stage of development and is significantly further behind than wind, solar and even tidal energy technologies. No ocean current turbines are currently providing power, but a few designs have been tested and demonstrated. Several different technologies are being researched and developed. Horizontal axis turbines, which are similar to wind turbines, are the furthest along. Prototypes have been tested and could potentially begin to see commercial development within the next decade, although progress still needs to be made. Some of the technical challenges associated with this resource include corrosion, preventing marine buildup and protecting against cavitation, which is the formation of bubbles. Energy technologies have continually progressed as long as humans have been using them, and their development is far from over. Offshore renewable energy may be the next big thing in the energy industry as offshore wind and solar begin to take hold with tidal power following close behind and ocean current energy potentially playing a large role further into the future. Emily is an environmental writer, covering topics in renewable energy and sustainability. She is also the editor of Conservation Folks. Below the earth's surface, there's a source of power with impressive potential — geothermal energy. This source of power revolves around using the natural temperature of the earth to produce power and provide heating and cooling for buildings.